Snow globes are beloved for their soothing, ethereal effect, but these DIY glitter jars are even more mesmerizing. Made from simple household art supplies and mason jars, they create a swirling, iridescent sensory experience that can keep kids, or adults, calm, focused, and intrigued for hours (or at least minutes) on end. Making glitter jars is a great project for kids to help out on too. They could be a fun birthday party or playdate activity or even make a pretty office or holiday gift. They're easy to make and it only takes about five minutes. Gather these supplies ahead of time. A mason jar is recommended if you are making these for adults. If you are making them for (and with) children, it's best to pick a non-breakable container. It should be clear and sealable. A plastic container with a secure lid is probably best. Since you are working with glitter, it's also best to fully cover your work surface with a tarp or old newspaper. 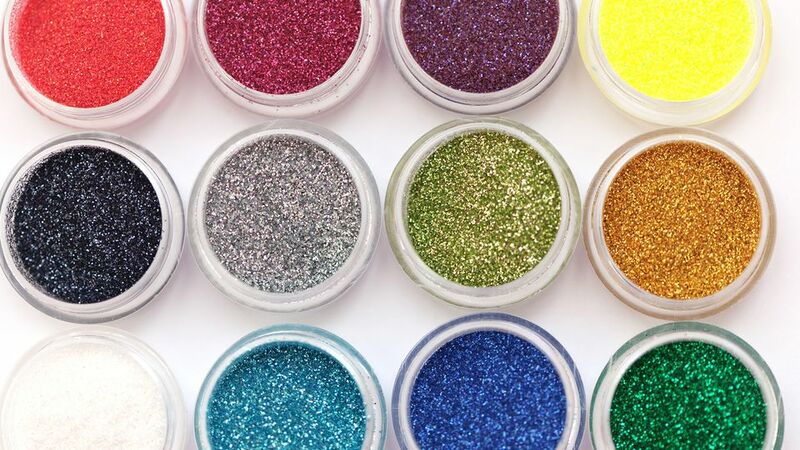 You can use the same color glitter glue and glitter or mix colors. The overall effect will be the same but each jar will look different depending on the color variations. You can also vary the size of the glitter and again, either mix sizes or keep each size separate. Follow these directions to make your own glitter jar. Depending on the size of your jar or bottle, fill it about ¾ of the way with warm water. Be sure to measure how much water you're using. For every cup of water you use, add 1 to 2 tablespoons of glitter glue to the jar. Add the glitter until it’s a ½ inch to ¾ of an inch deep from the bottom of the jar. Next, if you'd like, add a few drops of food coloring to the jar for a bolder color. Start with just a drop or two and swirl around. Continue adding food coloring until the contents are the desired color. Close the jar. You can seal the lid with glue for extra protection before closing. Now you are ready to shake your jar and watch the glitter slowly move around. These jars can help keep kids calm and relaxed or provide a nice break on a work desk. Store the glitter jars in a safe place. If you notice the lid is open or the seal is breaking, either reseal or discard the jar. You don't want the contents of the jar to spill. Once you have made your glitter jars, you can use them to discuss mindfulness and feelings. As the glitter jar sits undisturbed, all the glitter rests at the bottom of the jar and you can see through the jar. The glitter can represent thoughts. If your child is feeling angry or upset, thoughts are swirling and they can't see, act, or think clearly. This is the glitter when it gets shaken up. As you watch the glitter settle back down, this is a good lesson in how using mindfulness can settle the mind and allow you to see, act, and think clearly again.